Home › Speakers › Madhukar Trivedi, M.D. Most recently, Dr. Trivedi has been selected to Lead the team conducting the EMBARC project. This project is at the core of the NIMH’s initiative to identify a biosignature for depression. This work will focus on neuroimaging, EEG, clinical and behavioral phenotypes and other blood-based biological markers. His ongoing work as the Lead PI of the EMBARC study provides an extensive background for his contribution to the Neurobiological Markers employed in the study. Note this grant is designed to be a linchpin in the development of a biosignature for depression and is unique in its design to evaluate biomarkers from across full spectrum possible biological markers. As the lead site, he will be able to provide new clinical research opportunities to work at cutting edge of translational research in depression. 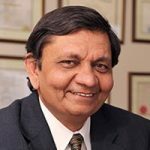 Dr. Trivedi has received numerous awards including the Gerald L. Klerman award from the National Depressive and Manic-Depressive Association Scientific Advisory Board-NDMDA and the Psychiatric Excellence Award from the Texas Society of Psychiatric Physicians-TSPP. Dr. Trivedi has mentored multiple psychopharmacology postdoctoral fellows and research track residents over the past many years in Mood and Anxiety Disorders and is the Principal Investigator of an NIMH-funded Postdoctoral T32 training program. He is or has been a member of several institutional review groups of the NIMH. Dr. Trivedi has published over 380 articles and chapters related to the Diagnosis and Treatment of Mood Disorders.